Heading into winter late last year we were told that it was going to be one for the record books. And so it has been. Temperatures have yet to go into minus territory and there are towns in Texas with more snowfall than we’ve had. It’s downright bizarre. But I’m a believer in meteorological karma. Sure, we’re trending way behind average snowfall to date. But that doesn’t mean Old Man Winter can’t go for a late game Hail Mary. I’ll put away the shovel in June. That’s basically the philosophy of preparedness behind a slew of winter-focused applications created by the City of Chicago over the last weeks at chicagoshovels.org. It’s all about scales of sharing, really. Last year’s blizzard showed a side of our city rarely talked about: authentic neighborliness. Chicagoans came to each others’ aid, made friends on stranded public transit, and generally bonded in the face of potential calamity. The idea behind Chicago Shovels is to facilitate this latent drive to be good neighbors, to offer tools for sharing in the common experience of a heavy snowfall. The sharing extends to the code itself. Civic-minded volunteers came together to build parts of Chicago Shovels and some of the code itself was shared via a Code for America-developed project in Boston. And, of course, we’re sharing what we’ve built on our Github account. Cross-municipality, open source development is the way forward. Many different threads of Mayor Emanuel’s technology mandate are bound together in Chicago Shovels. Plow Tracker, the first app to launch and certainly the most popular, is a good case study in open data for transparency and accountability. While I talk a lot about open data as a driver of economic development and as analytics fodder, the lesson from Plow Tracker’s launch — and the record-shattering traffic it drove to the city’s website — is that we shouldn’t forget that the ability to peer into the workings of government is the first and possibly most important function of open data. The Tracker is a good illustration of our open data initiatives: more information is always better than less. If there are patterns to be found, they will be. And no matter what they are, such analysis leads to a more efficient city government. Plow Tracker is only on during storms, of course. 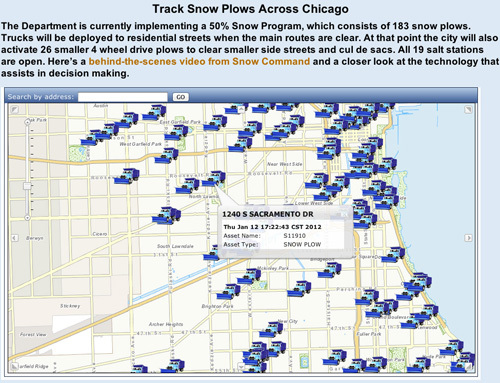 It shows where plows are in real-time with a bit of information as to the city “asset” you are looking at. This is normally salt-spreading plows, but in bigger snow events can include garbage trucks with “quick-hitch” plows attached and even other city vehicles outfitted to plow. As Chicagoist pointed out, watching the map can remind you of a certain popular video game from the 1980’s. Feedback from the public, coverage in the press, and inquiries from other cities has been overwhelmingly positive. Many have asked for increased functionality, such as a visualization of what streets are cleared. This is tough, as we do not have real-time data on the status of city streets, except what can be visually inspected via cameras and the plow drivers themselves. A last note on (and lesson from) the Tracker: context is key. The little text blurb above the map is really crucial to understanding what you are looking at. As an example, sometimes plows are deployed before it starts snowing for preemptive salting of bridge decks. If you did not have this information it would be difficult to rationalize the placement of plows. It’s a lesson for open data in general. The more data, especially real-time data, the more context matters. 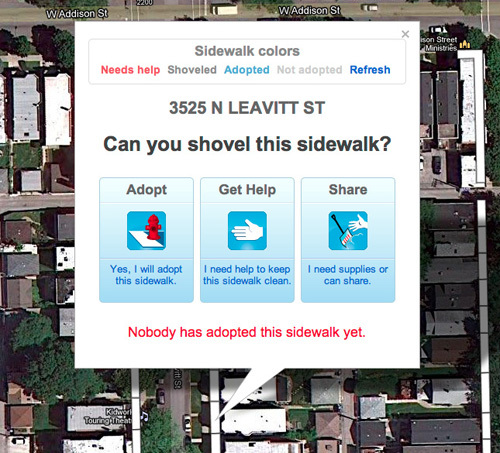 The site’s most recently launched app, Adopt-a-Sidewalk, represents the original idea for Chicago Shovels. Last fall, as Chicago was preparing to become a 2012 Code for America city, we learned about a side project from the Code fellows in Boston. Early in 2011 they had arrived to work on a project with Boston schools but were met with a blizzard. So they built Adopt-a-Hydrant. This idea was to encourage residents to “claim” fire hydrants for shoveling out during the winter. Simple, smart, the right thing to do. And the code was open source. So we took it with the idea of creating something similar but focused on the public way. We thought we could go a bit bigger than hydrants. See, the Chicago Municipal Code requires residents and businesses to shovel the sidewalk in front of their property. So why not allow them to claim it or claim someone else’s — or ask for help? Claim a parcel, mark it as cleared, track your achievements. Again, this has been one weird winter. Snow is scarce and temps are routinely above 40. If it ever does snow again, though, Adopt-a-Sidewalk is ready to promote community responsibility and actual sharing. We partnered with local startup OhSoWe to integrate neighborhood-based sharing into Adopt-a-Sidewalk. Locate your sidewalk — or a parcel you’d like to help out on — and instantly see who around you is willing to lend shovels, salt, even a snow blower. The truth is that having Mother Nature on the critical path to deployment is a tough, stressful thing. (She’s neither agile nor a fan of the Gannt.) We knew snow was coming and we knew we needed Plow Tracker up for the first major storm. Launching an app was something that could not slip. Adopt-a-Sidewalk, while built with volunteer assistance, was partially an effort at proving that municipal code sharing is real and viable. Both of these builds demonstrate that the City will create apps when there are reasons to do so. But that in no way detracts from our belief that the community and the marketplace are the sources of real innovation that come from Chicago’s open data. And we have that too. Chicago Shovels’ last major app category showcases community-built applications. The two most useful are actually wintertime reworkings of earlier incarnations. Last year civic über-developer Scott Robbin built SweepAround.us, an app for alerting residents the night before the City would be sweeping streets in their area so they could move their cars from the street (avoiding a ticket). This was the perfect app for tweaking to accommodate a system for alerts about the City’s 2″ Snow Parking Ban. SweepAround.us became 2inch.es. Similarly, Robbin’s wildly popular wasmycartowed.com was updated to include automobile relocations due to snow emergencies. A slew of winter-related resources round out the site, including a number of winter-related apps from last year’s Apps for Metro Chicago competition, information on how to become part of the City’s official volunteer “Snow Corps”, one-click 311 request submission, FAQ’s, and subscription to Notify Chicago alerts. Chicago Shovels is the city’s best example to date of the value of open data. Transparency and accountability (Plow Tracker), reuse and sharing (Adopt-a-Sidewalk), business creation (Clear Streets), efficiency and ease-of-use (2inch.es and wasmycartowed.com) — these are the outcomes of a policy of exposing the vital signs of the city. Now if it would only snow — and stick. These are very valuable apps to deal with one of the constant problems here in Chicagoland (the snow that is non-existent this year). I am reviewing and evaluating New York City’s digital city planning on my tumblr blog, taking each section of their master plan for review and comment.